Help! I found a baby rabbit, what should I do ? Cottontail rabbits nest from March through September and may have as many as four litters per year. The average litter contains between 4 and 5 babies. 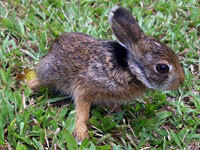 Young rabbits leave the nest at about 15-20 days old (2 ½ to 3 weeks). By three weeks of age, they are on their own in the wild and no longer require their mother’s care. Is the rabbit fully furred WITH it’s eyes open and appears bright-eyed and unharmed? If YES, and the rabbit is the size of an orange (not a tangerine) then it is on it’s own and does not need human intervention. As long as it appears to be unharmed, do your best to keep children and pets away from the baby and leave the area. It is normal for cottontails to remain inactive and quiet during the day or when under stress. Instinct tells them that the best defense is to freeze and stay motionless until the danger passes. No matter how calm a baby bunny might seem around you , YOU are the danger. If you are still in doubt, then contact your local wildlife rehabilitator for more information. If NO, then attempt to locate the nest (a shallow depression made into the ground and lined with fur and/or grass , cottontails DO NOT burrow). Nests that must be moved (due to construction) may be relocated up to 20 feet away from the original site. Construct a similar nest in the new location and place as much of the original fur and nesting material back into the nest. Place the babies in the nest (if they hop out again then TEMPORARILY place a small box upside down over the nest so that the babies can settle down in the new location. (note: be very careful of doing this on a hot summer day babies can overheat easily.) Remove the box before nightfall so that when mom returns to the nest she can reach the babies. Not sure if mom is coming back to care for the babies? Rabbits feed at dawn and dusk, so it is unlikely that you will ever see the mother. To determine if mom has been coming to care for the babies, check them every day or every other day for the following signs. Young rabbits should appear plump, with smooth skin and shiny coats. If the babies appear thin and weak with wrinkled, baggy skin then contact a licensed rehabilitator immediately. Another way to determine if mom has been there to feed and care for the babies is to sprinkle the area around the nest with flour or powder and check in the morning for mom’s footprints. If it looks like rain is predicted, then place a couple small twigs over the nest in “cross” or an “x” fashion. In the morning, if mom has been there, the twigs will be moved. If there is no sign of disturbance to the nest, call a rehabilitator immediately.